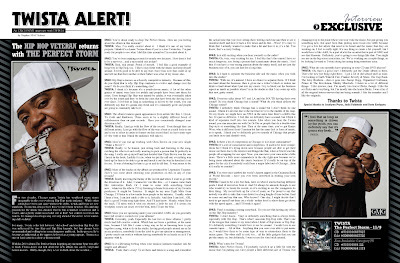 Discussions Magazine Music Blog: An EXCLUSIVE Interview With TWISTA! 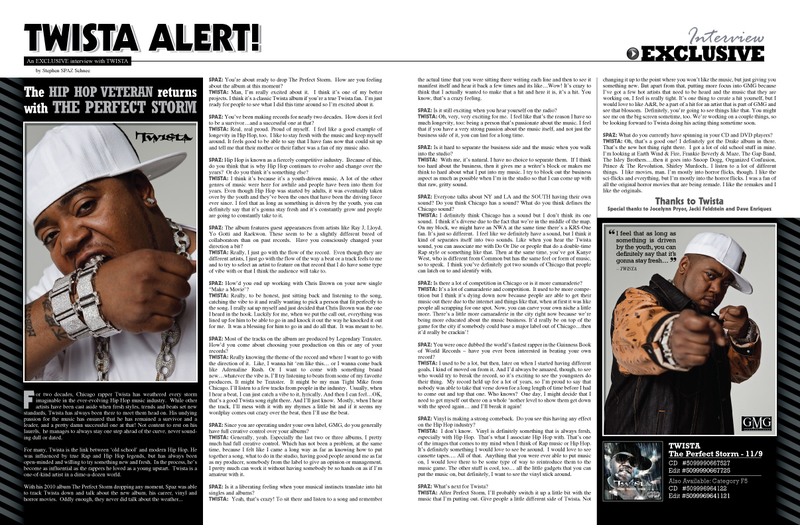 An EXCLUSIVE Interview With TWISTA! For two decades, Chicago rapper Twista has weathered every storm imaginable in the ever-evolving Hip Hop music industry. While other artists have been cast aside when fresh styles, trends and beats set new standards, Twista has always been there to meet them head on. His undying passion for the music has ensured that he has remained a survivor and a leader, and a pretty damn successful one at that! Not content to rest on his laurels, he manages to always stay one step ahead of the curve, never sounding dull or dated. For many, Twista is the link between ‘old school’ and modern Hip Hop. He was influenced by true Rap and Hip Hop legends, but has always been open-minded and willing to try something new and fresh. In the process, he’s become as influential as the rappers he loved as a young upstart. Twista is a one-of-kind artist in a dime-a-dozen world. SPAZ: You’re about ready to drop The Perfect Storm. How are you feeling about the album at this moment? TWISTA: Man, I’m really excited about it. I think it’s one of my better projects. I think it’s a classic Twista album if you’re a true Twista fan. I’m just ready for people to see what I did this time around so I’m excited about it. SPAZ: You’ve been making records for nearly two decades. How does it feel to be a survivor…and a successful one at that? TWISTA: Real, real proud. Proud of myself. I feel like a good example of longevity in Hip Hop, too. I like to stay fresh with the music and keep myself around. It feels good to be able to say that I have fans now that could sit up and tell me that their mother or their father was a fan of my music also. SPAZ: Hip Hop is known as a fiercely competitive industry. Because of this, do you think that is why Hip Hop continues to evolve and change over the years? Or do you think it’s something else? TWISTA: I think it’s because it’s a youth-driven music. A lot of the other genres of music were here for awhile and people have been into them for years. Even though Hip Hop was started by adults, it was eventually taken over by the youth and they’ve been the ones that have been the driving force ever since. I feel that as long as something is driven by the youth, you can definitely say that it’s gonna stay fresh and it’s constantly grow and people are going to constantly take to it. SPAZ: The album features guest appearances from artists like Ray J, Lloyd, Yo Gotti and Raekwon. These seem to be a slightly different breed of collaborators than on past records. Have you consciously changed your direction a bit? TWISTA: Really, I just go with the flow of the record. Even though they are different artists, I just go with the flow of the way a beat or a track feels to me and to try to select an artist to feature on that record that I do have some type of vibe with or that I think the audience will take to. SPAZ: How’d you end up working with Chris Brown on your new single “Make a Movie’? TWISTA: Really, to be honest, just sitting back and listening to the song, catching the vibe to it and really wanting to pick a person that fit perfectly to the song. I really sat up myself and just decided that Chris Brown was the one I heard in the hook. Luckily for me, when we put the call out, everything was lined up for him to be able to go in and knock it out the way he knocked it out for me. It was a blessing for him to go in and do all that. It was meant to be. SPAZ: Most of the tracks on the album are produced by Legendary Traxster. How’d you come about choosing your production on this or any of your records? TWISTA: Really knowing the theme of the record and where I want to go with the direction of it. Like, I wanna hit ‘em like this… or I wanna come back like Adrenaline Rush. Or I want to come with something brand new…whatever the vibe is. I’ll try listening to beats from some of my favorite producers. It might be Traxster. It might be my man Tight Mike from Chicago. I’ll listen to a few tracks from people in the industry. Usually, when I hear a beat, I can just catch a vibe to it, lyrically. And then I can feel…OK, that’s a good Twista song right there. And I’ll just know. Mostly, when I hear the track, I’ll mess with it with my rhymes a little bit and if it seems my wordplay comes out crazy over the beat, then I’ll use the beat. SPAZ: Since you are operating under your own label, GMG, do you generally have full creative control over your albums? TWISTA: Generally, yeah. Especially the last two or three albums, I pretty much had full creative control. Which has not been a problem, at the same time, because I felt like I came a long way as far as knowing how to put together a song, what to do in the studio, having good people around me as far as my producer, somebody from the label to give an opinion or management. I pretty much can work it without having somebody be so hands on as if I’m amateur with it. SPAZ: Is it a liberating feeling when your musical instincts translate into hit singles and albums? TWISTA: Yeah, that’s crazy! To sit there and listen to a song and remember the actual time that you were sitting there writing each line and then to see it manifest itself and hear it back a few times and its like…Wow! It’s crazy to think that I actually wanted to make that a hit and here it is, it’s a hit. You know, that’s a crazy feeling. SPAZ: Is it still exciting when you hear yourself on the radio? TWISTA: Oh, very, very exciting for me. I feel like that’s the reason I have so much longevity, too: being a person that’s passionate about the music. I feel that if you have a very strong passion about the music itself, and not just the business side of it, you can last for a long time. SPAZ: Is it hard to separate the business side and the music when you walk into the studio? TWISTA: With me, it’s natural. I have no choice to separate them. If I think too hard about the business, then it gives me a writer’s block or makes me think to hard about what I put into my music. I try to block out the business aspect as much as possible when I’m in the studio so that I can come up with that raw, gritty sound. SPAZ: Everyone talks about NY and LA and the SOUTH having their own sound? Do you think Chicago has a sound? What do you think defines the Chicago sound? TWISTA: I definitely think Chicago has a sound but I don’t think its one sound. I think it’s diverse due to the fact that we’re in the middle of the map. On my block, we might have an NWA at the same time there’s a KRS-One fan. It’s just so different. I feel like we definitely have a sound, but I think it kind of separates itself into two sounds. Like when you hear the Twista sound, you can associate me with Do Or Die or people that do a double-time Rap style or something like that. Then at the same time, you’ve got Kanye West, who is different from Common but has the same feel or form of music, so to speak. I think you’ve definitely got two sounds of Chicago that people can latch on to and identify with. SPAZ: Is there a lot of competition in Chicago or is it more camaraderie? TWISTA: It’s a lot of camaraderie and competition. It used to be more competition but I think it’s dying down now because people are able to get their music out there due to the internet and things like that, when at first it was like people all scrapping for one spot. Now, you can carve your own niche a little more. There’s a little more camaraderie in the city right now because we’re being more educated about the music business. It’d really be on top of the game for the city if somebody could base a major label out of Chicago…then it’d really be crackin’! SPAZ: You were once dubbed the world’s fastest rapper in the Guinness Book of World Records – have you ever been interested in beating your own record? TWISTA: I used to be a lot, but then, later on when I started having different goals, I kind of moved on from it. And I’d always be amazed, though, to see who would try to break the record, so it’s exciting to see the youngsters do their thing. My record held up for a lot of years, so I’m proud to say that nobody was able to take that verse down for a long length of time before I had to come out and top that one. Who knows? One day, I might decide that I need to get myself out there on a whole ‘nother level to show them get down with the speed again… and I’ll break it again! SPAZ: Vinyl is making a strong comeback. Do you see this having any effect on the Hip Hop industry? TWISTA: I don’t know. Vinyl is definitely something that is always fresh, especially with Hip Hop. That’s what I associate Hip Hop with. That’s one of the images that comes to my mind when I think of Rap music or Hip Hop. It’s definitely something I would love to see be around. I would love to see cassette tapes…. All of that. Anything that you were ever able to put music on, I would love there to be some type of way to reintroduce them to the music game. The other stuff is cool, too… all the little gadgets that you can put the music on, but definitely, I want to see the vinyl stick around. SPAZ: What’s next for Twista? TWISTA: After Perfect Storm, I’ll probably switch it up a little bit with the music that I’m putting out. Give people a little different side of Twista. Not changing it up to the point where you won’t like the music, but just giving you something new. But apart from that, putting more focus into GMG because I’ve got a few hot artists that need to be heard and the music that they are working on, I feel is really tight. It’s one thing to create a hit yourself, but I would love to like A&R, be a part of a hit for an artist that is part of GMG and see that blossom. Definitely, you’re going to see things like that. You might see me on the big screen sometime, too. We’re working on a couple things, so be looking forward to Twista doing his acting thing sometime soon. TWISTA: Oh, that’s a good one! I definitely got the Drake album in there. That’s the new hot thing right there. I got a lot of old school stuff in mine. I’m looking at Earth Wind & Fire, Frankie Beverly & Maze, The Gap Band, The Isley Brothers….then it goes into Snoop Dogg, Organized Confusion, Prince & The Revolution, Shirley Murdoch.. I listen to a lot of different things. I like movies, man. I’m mostly into horror flicks, though. I like the sci-flicks and everything, but I’m mostly into the horror flicks. I was a fan of all the original horror movies that are being remade. I like the remakes and I like the originals.